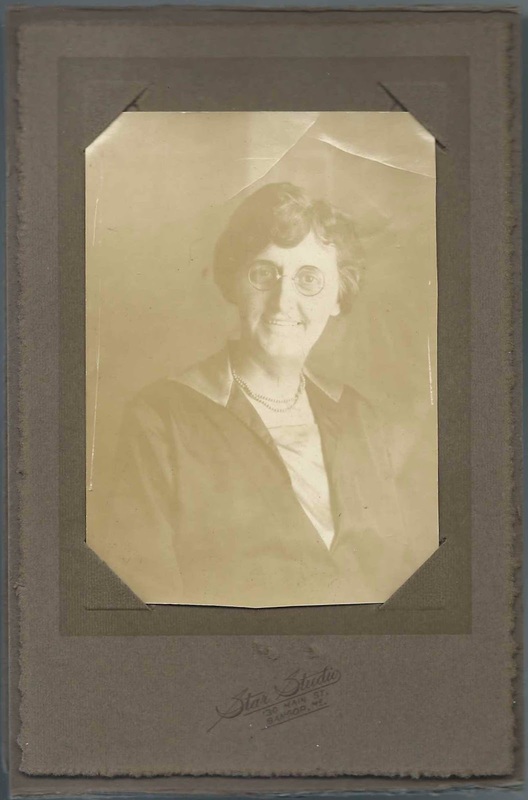 Photograph by the Star Studio of Bangor, Maine, of Hattie Mae (Hartshorn) Moore of Swanville, Maine, and Bangor, Maine. The photograph, which itself measures 3-3/4" by 2-3/4", is enclosed in a jacket. Hattie's identification is written just above the pane containing her photograph, as shown below. See another post that features photographs of a younger Hattie Mae and her brother Zenas Downs Hartshorn and a post that features a photograph of their grandfather Zenas Downs of Swanville, Maine. 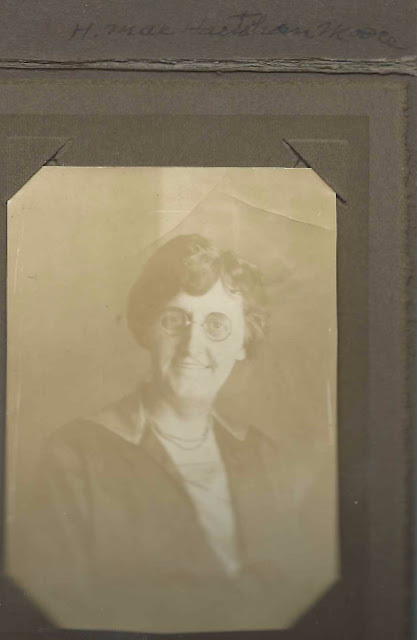 Hattie Mae Hartshorn was born at Swanville, Maine, on July 23, 1883, the daughter Charles Andrew Hartshorn and Martha Eva (Downs) Hartshorn - from her birth record in Maine Vital Records 1670-1921. Another record in that same database shows that Hattie married Andrew P. Moore at Swanville, Maine, on March 21, 1906. According to a record in the Maine, Faylene Hutton Cemetery Collection, 1780-1990, Andrew Park Moore was born at Frankfort, Maine, on November 11, 1879, son of Elias Moore and Martha (True) Moore. At the time of their marriage, Hattie was a teacher and Andrew, the son of Elias B. Moore and a farmer. At some point in the 1920s, Andrew and Hattie moved to Bangor, where they apparently lived for the rest of their lives. I didn't find records of any children born to them. Andrew died in 1952 and Hattie in 1920. They're buried in the Greenlawn Cemetery at Swanville, Maine. If you have corrections and/or additions to the information above, please leave a comment or contact me directly.